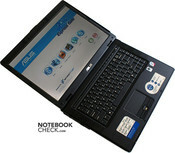 Having produced notebooks for many years, Asus have continuously extended their product range. 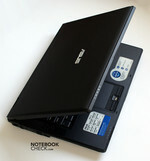 Finally Asus also offers business notebooks. We had the chance to test one of them, the B50A. It tries to convince with sophisticated features, e.g., a WXGA+ screen, an HDMI interface, and Altec Lansing loudspeakers. 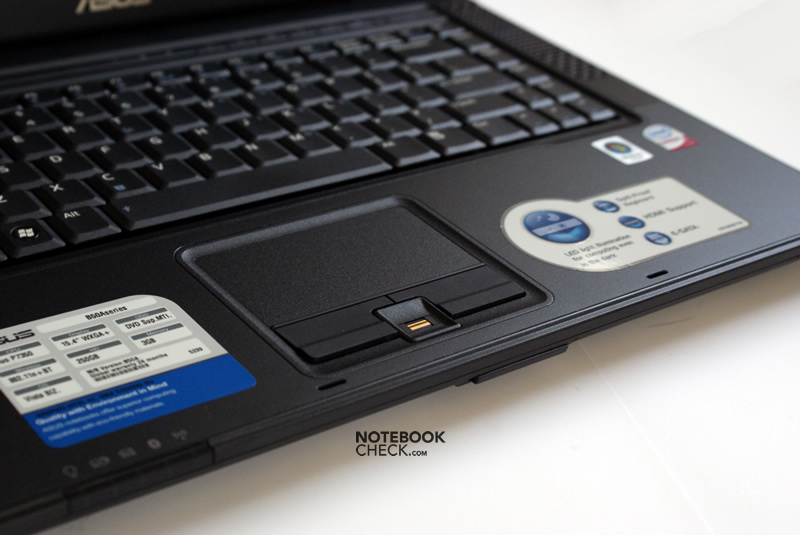 We would like to thank our Polish colleagues from notebookcheck.pl, who carried out the test and provided us with this review. 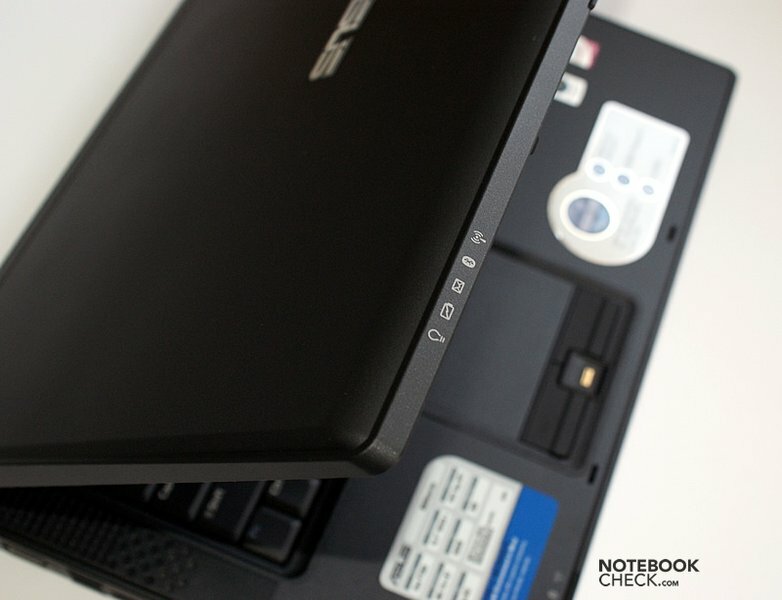 Looking at the Asus B50A it seems as if it fortunately neglects many of today's trends. It is huge, heavy, and uses matte surfaces. 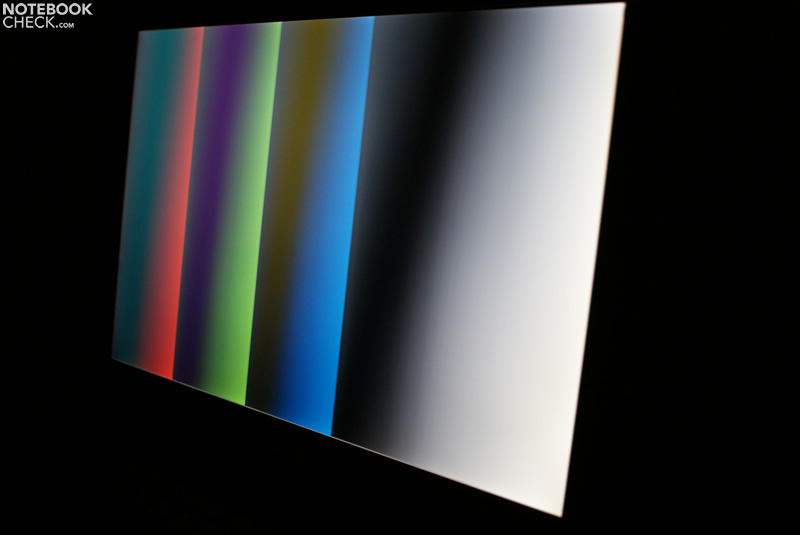 The later is also true for the anti-glare display. 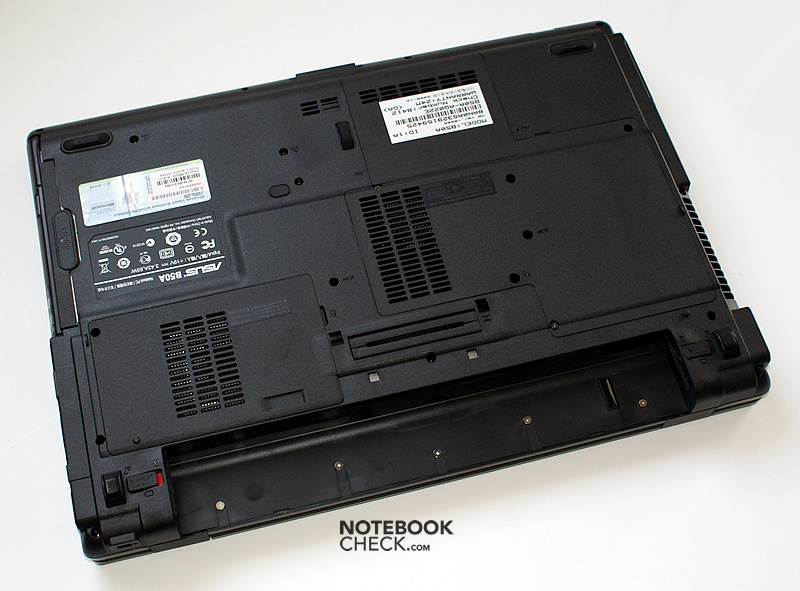 Here we also find the first similarity to the ThinkPad series, the well known clamshell design of the display lid, which should protect the closed notebook against penetration of objects between keyboard and display. The case is completely black without any useless decorative features in other colors. Altough most of the case is made of matte plastic, it proves to be rather stable. The palm rests only give in if stronger force is applied. Still, the workmanship of the case is flawless. So, you won't be able to hear any creaking noise during handling. Because of the massive construction it is also possible to pick the notebook up at an arbitrary corner. 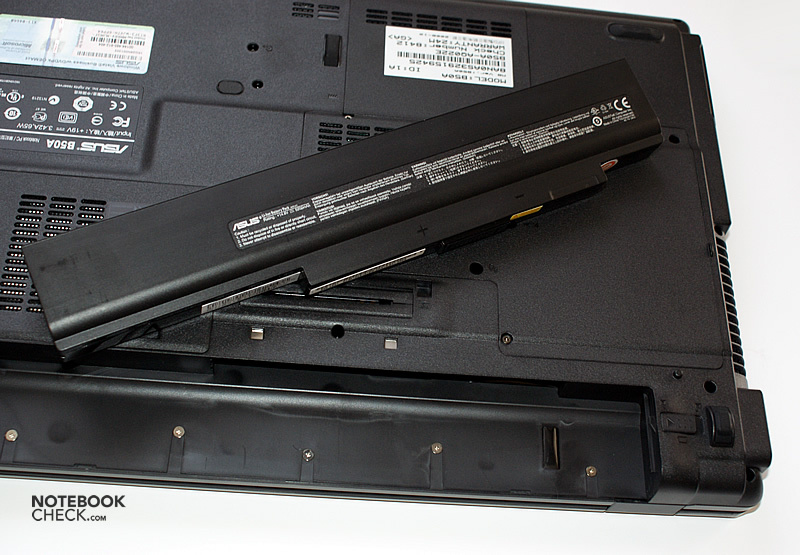 The display lid is pretty thick, but it doesn’t appear as durable as for example the one of the Lenovo IdeaPad Y530. 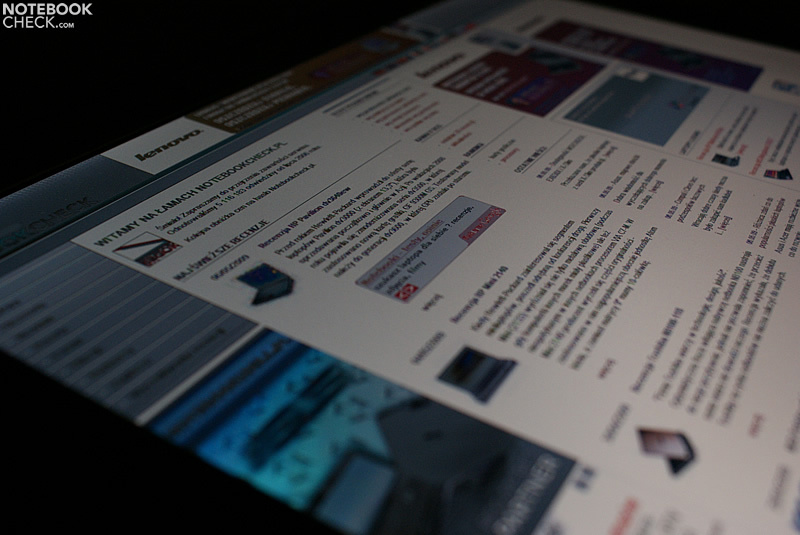 It slightly gives, if pressed, however, without causing image distortions on the powered screen. 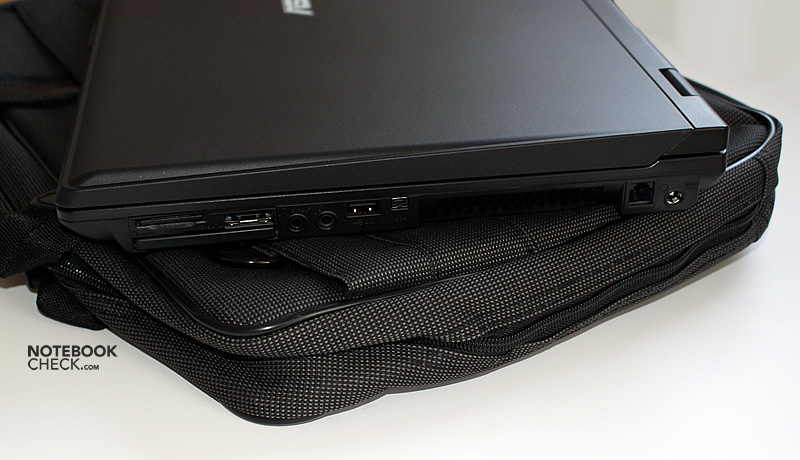 Because of the total weight of this laptop, we did not try to pick it up at a corner of the lid. 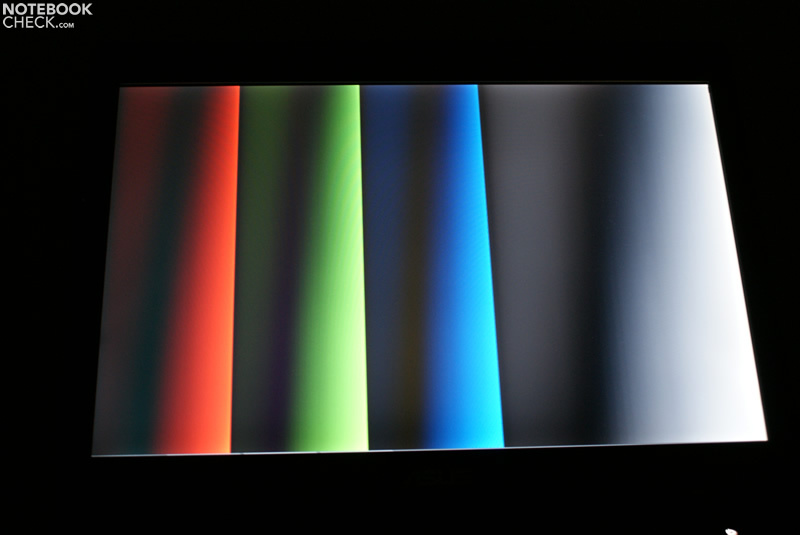 Nevertheless, the strong frame around the screen seems to ensure sufficient flexural rigidity. The hinges are free-moving. Nevertheless, they support the display very well. It is possible to open the lid with only one hand. However, the locking mechanism is quite complicated in use. 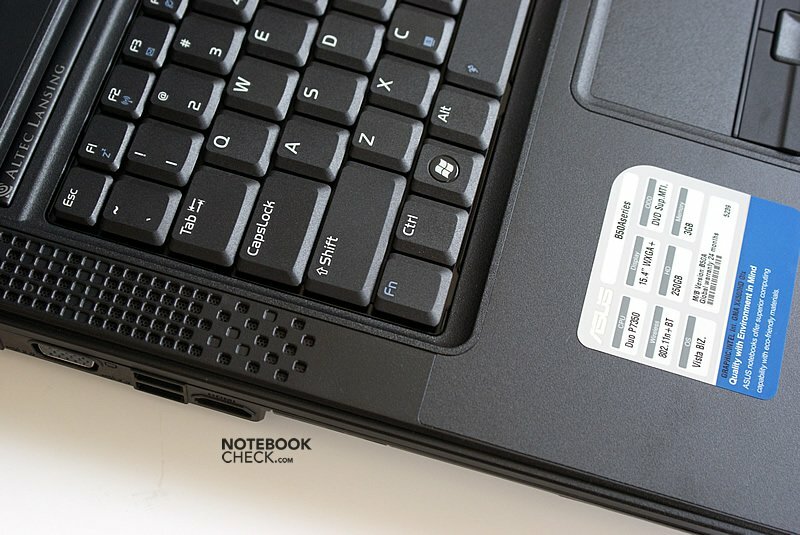 In order to open the notebook you need to press the button while at the same time lifting the lid. The connectivity leaves nothing to be desired. 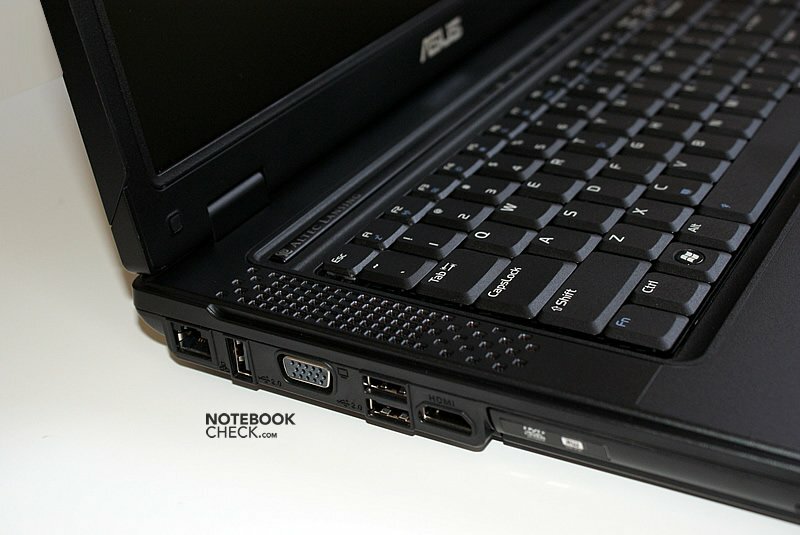 Asus even offers a digital video and audio port, HDMI. Four USB-2.0 ports are spread around the case, three of them are housed by the left side. 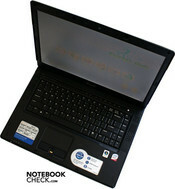 An e-SATA port for fast data transfer with peripherals like external hard drives is also available. Lefties can in general be content with the location of the ports. At the left side ports likely permanently in use are in the rear area. 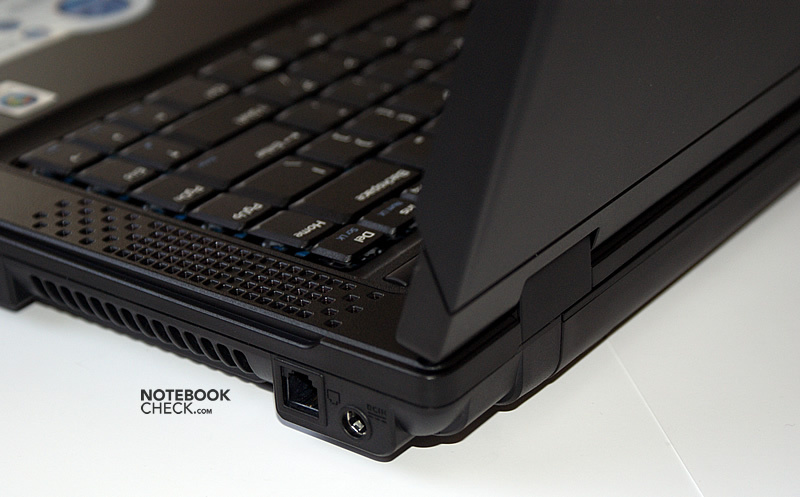 Depending on the use, righties might not be happy with the position of the e-SATA port and the audio ports. Both of them are located rather close to the front at the right side. Also the vent holes are at this side, however, quite at its rear part. 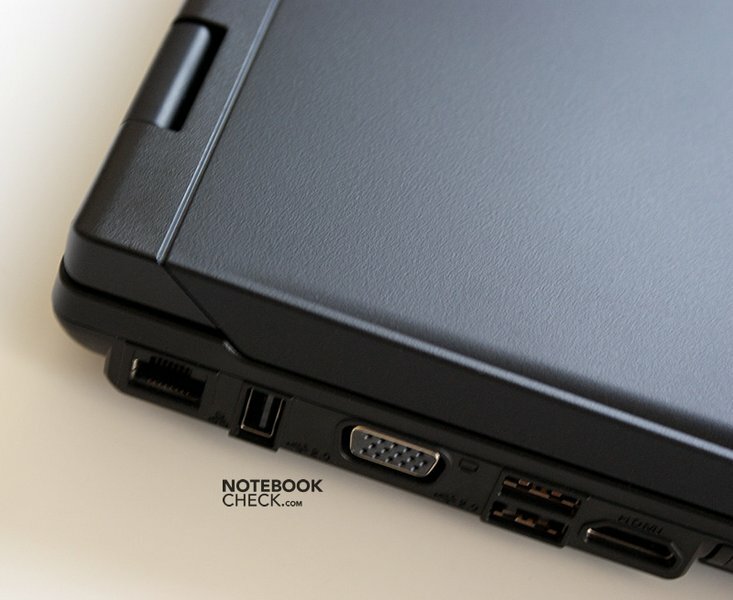 Furthermore, it is possible to easily integrate the notebook into an existing environment by connecting a docking station to its docking port. Besides an optional broadband modem, nothing is missing in terms of communication features. Such could for example be added by an ExpressCard. Depending on the infrastructure the B50A allows fast ethernet connections. The Intel Wireless WiFi Link 5100 AGN (abgn) also supports draft-n when connecting via a WiFi-hotspot. It is possible to communicate with small mobile devices like mobile phones or PDAs via the built-in Bluetooth 2.0+EDR module. And a FireWire-Port allows connecting peripherals. Together with the communication features the 1.3 MP WebCam allows video conferences. The test sample had Windows Vista Business 32-Bit preinstalled. 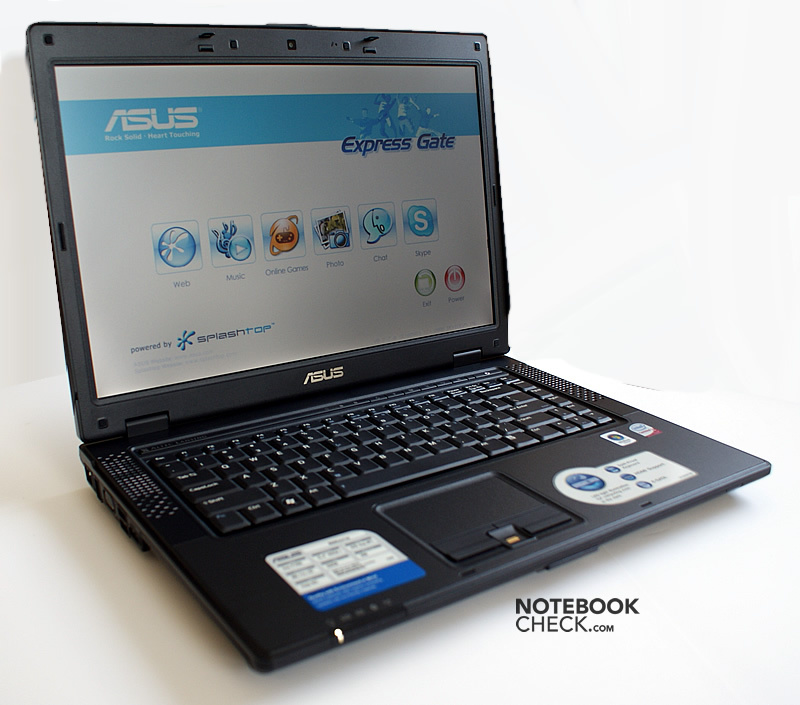 Asus also supports downgrading to Windows XP. Compatible drivers are available at the manufacturer's site. The scope of delivery also includes a carrying bag. The keyboard can rightly be called excellent. First of all it was attached to the case in a firm way and does not give anywhere. In addition it convinces by its mechanical properties like, e.g., an ideal key travel. However, as a matter of taste, the feedback could be a little better. Except of the reverse order of Fn and Ctrl key, we were also pleased by the keyboard layout. Furthermore, the typing noise is alright, so, the keyboard is not loud. That is with one exception, which is most likely specific to our test device: The Del key emits a telegraph-like sound if pushed energetically. 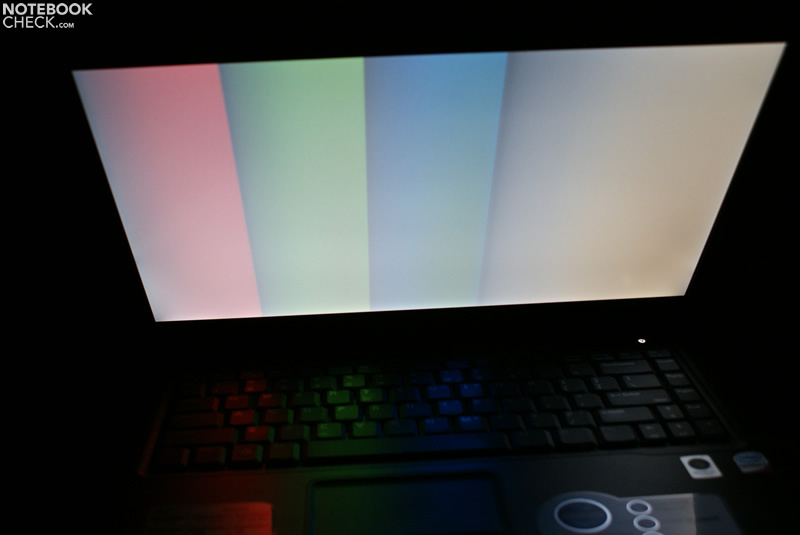 Although the touchpad has a rough surface, its gliding properties are not optimal. So it is sometimes hard to precisely control the mouse pointer. 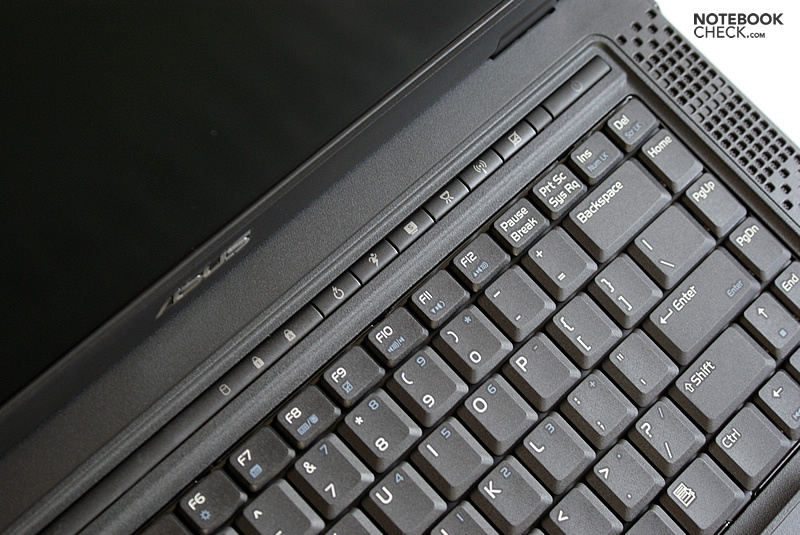 Its silicone-like buttons remind on those of HP Compaq laptops. However, compared to them they are stabler and respond better. We also liked their travel, which is not too long, and their silent clicking noise. 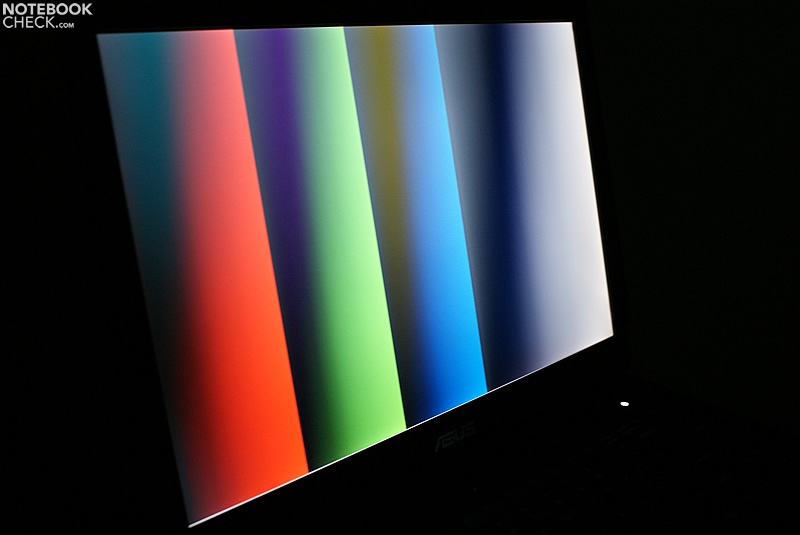 Asus have equipped the B50A with a matte screen from Chunghwa Picture Tubes (CPT). 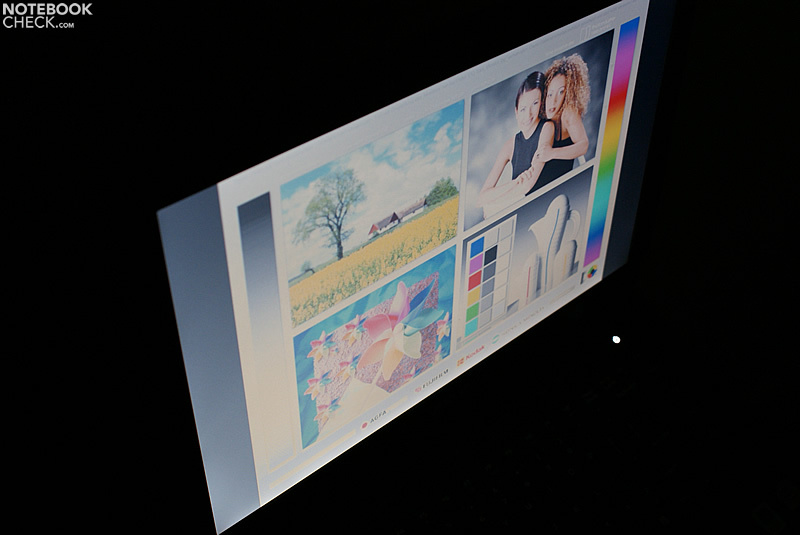 The 15.4 inch display offers WXGA+ resolution, that is a native resolution of 1440x900 pixels. According to our brightness measurements, which give a maximum of 193.9 cd/m² and an average of 160.2 cd/m² we can call it passable in this aspect. In terms of color representation a dominance of blue hues gets obvious. 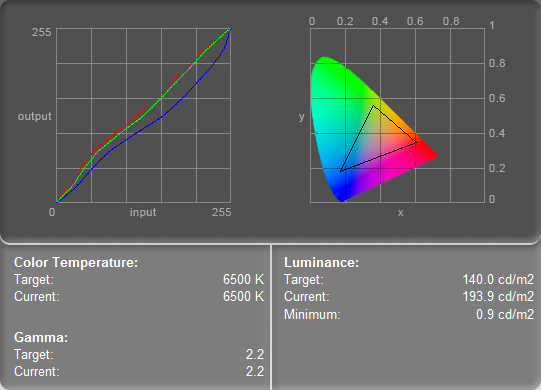 As a result the colors appear relatively cold. So, warm colors and white, which has a blue tint, do not look very good. The image is a little bit grainy. However, this problem is so small, that it should only get visible compared to a high-quality reference screen. The built-in Core 2 Duo P7350 Prozessor from Intel (-> manufacturer's information) works at a clock rate of 2.00 GHz and has a 3MB Level-2-Cache, and a 1066 MHz FSB. 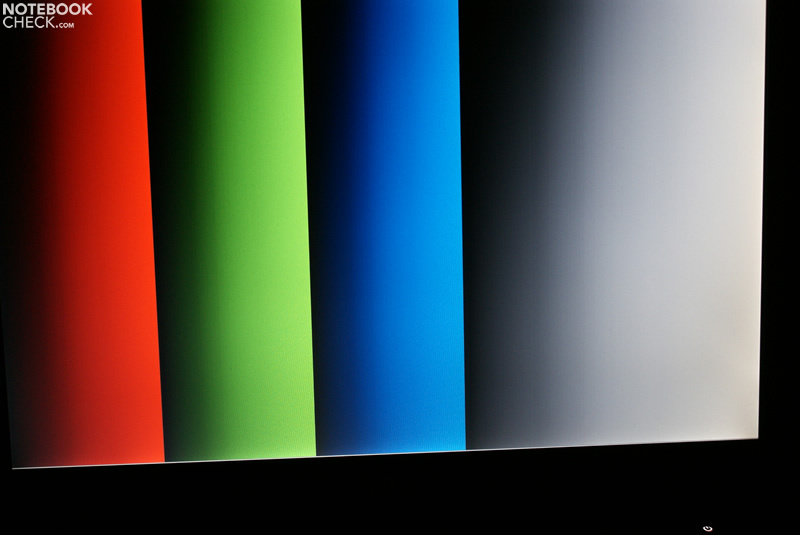 It belongs to the Penryn processors, which are manufactured in 45nm-lithography process. Compared to the Txxx processors (TDP: 35 Watt) of the same CPU family the P7350 needs with a 25 Watt TDP (Thermal Design Power) less energy. Asus has used the GM45 Chipsatz (-> manufacturer's information) in the B50A, which integrates the Intel GMA 4500M HD graphic chip. It supports DirectX-10.0, however, its 3D-performance is relatively meager. 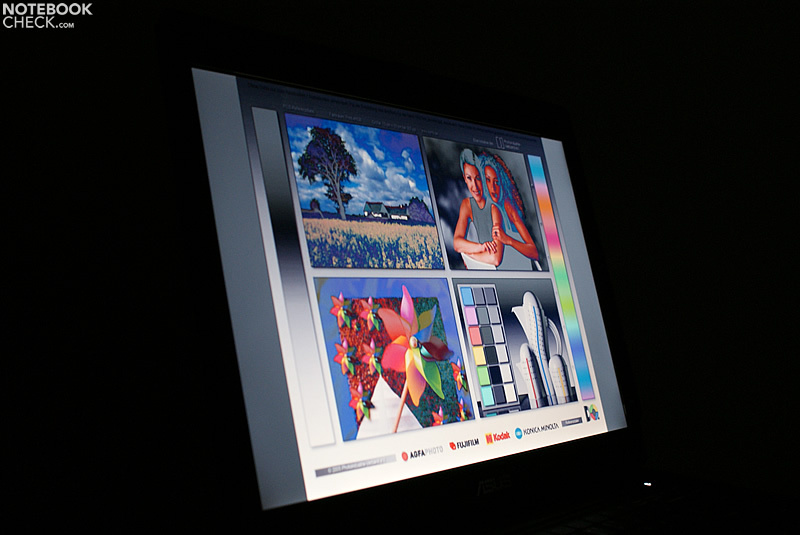 Therefore this graphical solution is not appropriate for 3D-intensive applications like, e.g., modern computer games. 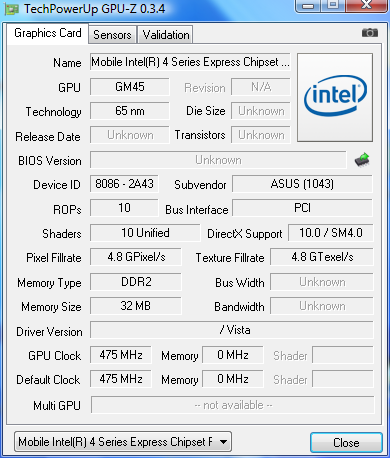 Further information about this is available in our gaming list and in our benchmark list of mobile graphic cards. 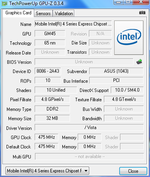 Unfortunately Asus does not offer an alternative configuration with dedicated graphics card. 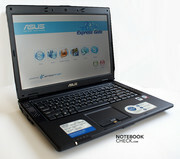 Although the GM45 chip set would support up to eight gigabytes of RAM, Asus limits the RAM capacity to four gigabytes. Our test sample was equipped with three gigabytes of RAM. Considering the other components and the pre-installed 32-bit operating system this is a sensible choice. The built-in mass storage contributes to the total performance too. The reviewed model came with a Seagate ST9250320AS, with 250 gigabyte gross capacity and a velocity of 5400 rpm. In the hard drive test HDTune it achieves average values. In this regard, the potential buyer can just opt for more capacity (320 GB), however, at equal velocity. 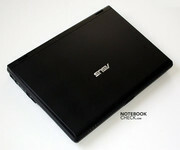 The built-in optical drive is a TSSTcorp CDDVDW TS-L633A. Idling or with low load the B50A is hardly audible. Even when the fan is switched on, a maximum of 36dB is not exceeded. 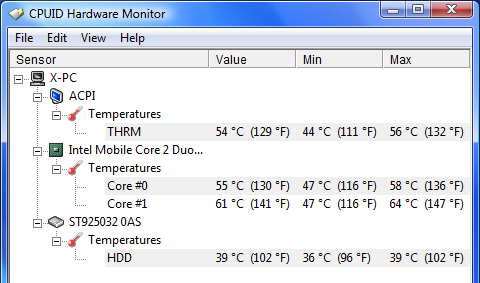 Only upon booting or heavier load the cooling system gets a little bit louder. 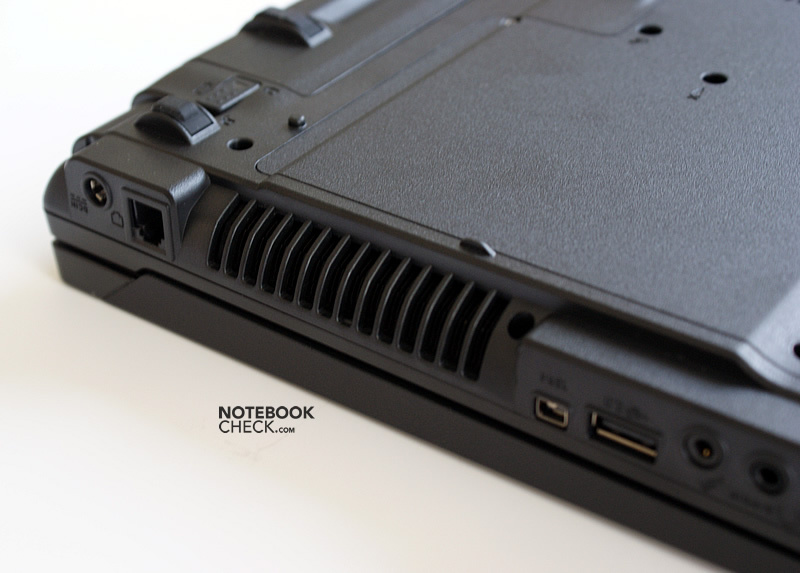 Furthermore, you should take care not to cover the louver, because this too increases the load of the cooling system. Unfortunately, the built-in optical drive is rather loud. So, the overall good impression in the aspect diminishes a little bit. While running usual office applications the Asus B50A can score points in this aspect. Under load the temperature increases a little more, however a maximum of 37 degrees measured at the underside, is still in the green. At least the B50A stays rather cool even after hours of work as long as the usage stays within the designated field of applications. (+) The maximum temperature on the upper side is 30.9 °C / 88 F, compared to the average of 33.9 °C / 93 F, ranging from 21.2 to 62.5 °C for the class Office. 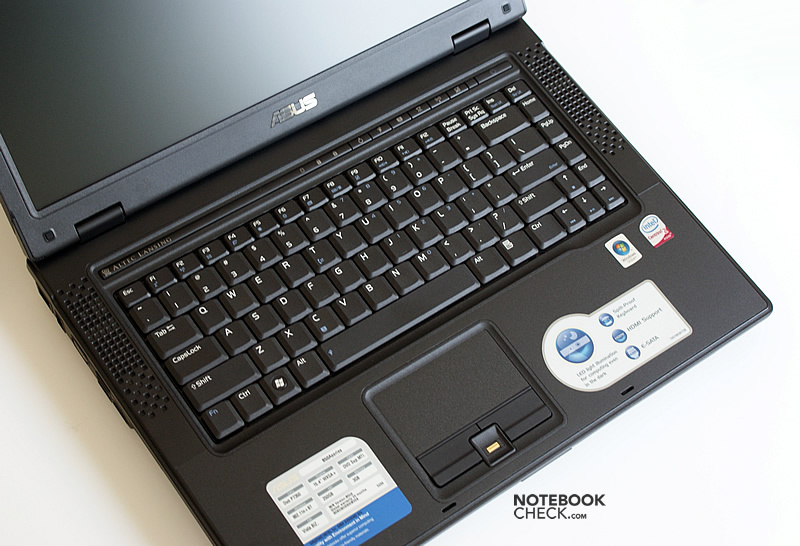 Usually the soundscape of a business notebook is not considered utterly important. Therefore, we were surprised to find Altec Lansing speakers left and right of the keyboard. 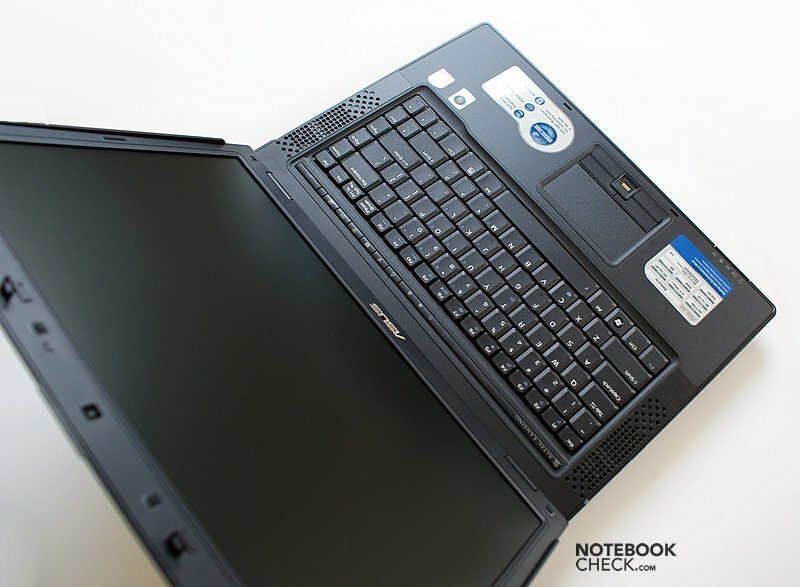 This time we had the chance to compare them to the speakers used in the Asus X61. It turned out that the soundscape of the B50A is fuller with less distortions. 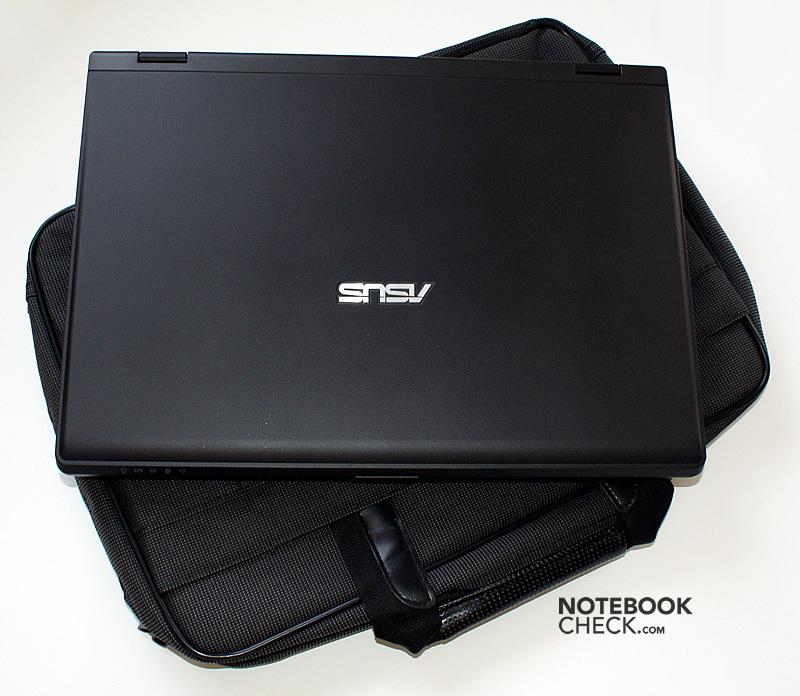 Asus have equipped the B50A with a capacious, yet pretty heavy (440 grams) 8-cell battery (5200mAh or 77Wh capacity). Considering the maximum battery life of five hours this seems to be a sensible choice. On average you can expect a battery life of about three hours if used in step with actual practice, e.g., browsing the Internet via WLAN. Although Asus breaks new ground with this business notebook, they developed a sophisticated and potentially successful laptop. Overall, the case leaves a positive and trustworthy impression. It seems solid, durable and fit for indoor and outdoor usage. In our opinion the keyboard got even better compared to those used in Asus' consumer notebooks. 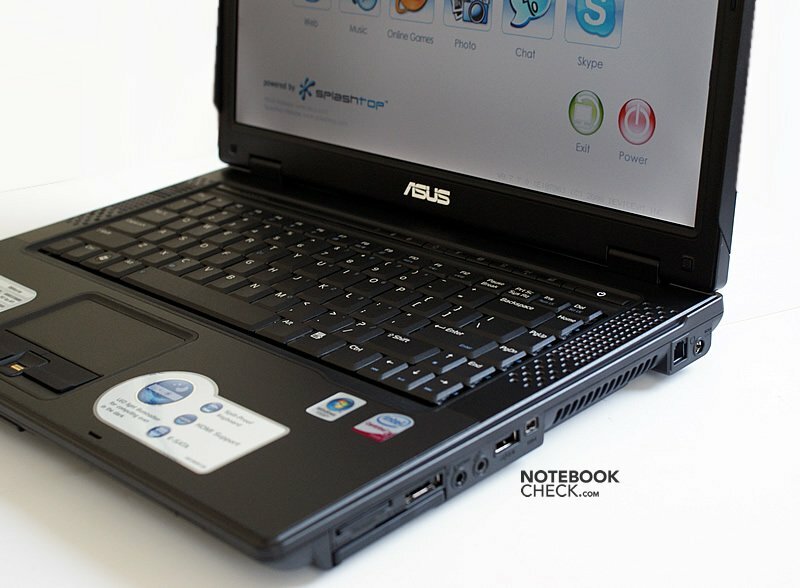 By using a matte display Asus meets the demands on a laptop designed for permanent professional usage. In spite of moderate brightness values, it can still cope with outdoor usage to some extent, because the screen does not reflect. Due to the capacious battery it is possible to work for about three hours and more without recharging. Furthermore this notebook is rather quiet and does not get too warm. Only the big weight decreases the mobility a little bit. The Asus B50A proves to be appropriate for business customer who appreciate solid workmanship, sophisticated solutions, and balanced application performance. Because of its weight and size it does, however, not belong to the ultra-mobile devices. Furthermore, the B50A was not designed for 3D-intensive applications. Furthermore, it is a rather quiet notebook. In general the surface temperatures stay in the green. 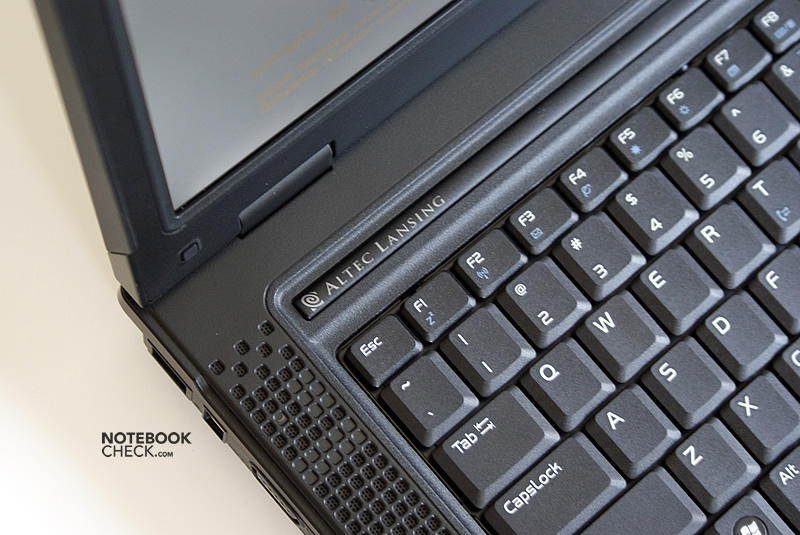 High-quality speakers, alike the Altec Lansing speakers in our test sample are rather rare in business notebooks. Also the matte, high-resolution screen was a sensible choice. Before opening the lid you have to push the latch. 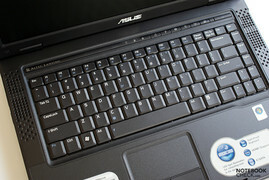 Asus decided to use conventional hot keys instead of touch-sensitive areas. 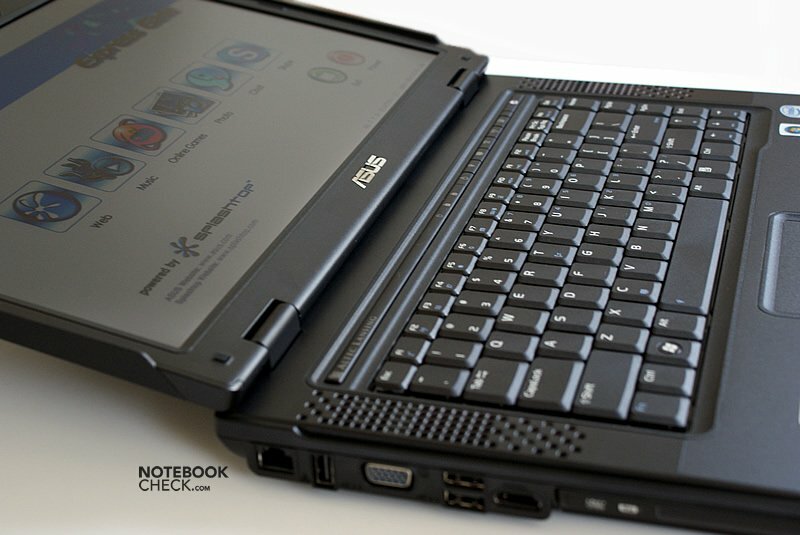 The quality of the keyboard increased compared to Asus' multimedia notebooks. It does not only look heavy. However, some surfaces, including the palm rests, are a bit rough. ... without glossy elements it can convince. Also the clamshell design reminds on these. whereas it is about on par with ThinkPads. 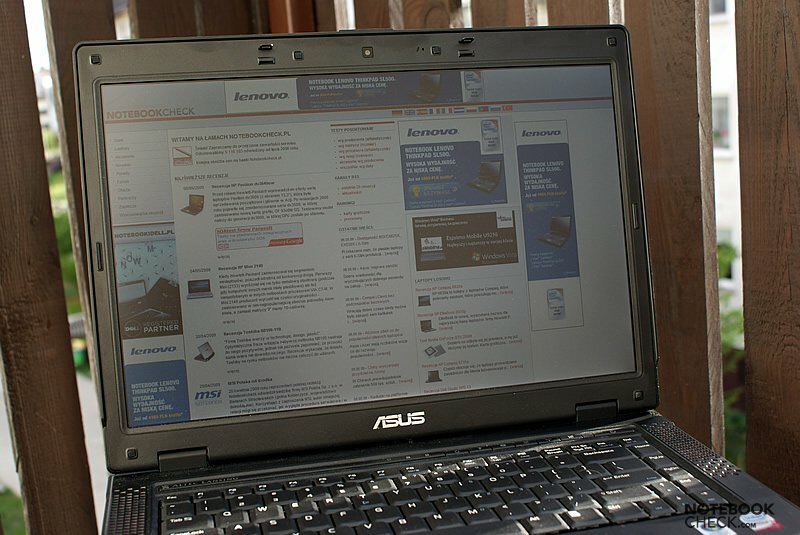 The Battery life is impressive, at least for an Asus notebook.